Deep in the heart of Texas, fans will get their first look at San Diego’s newest pro football team and the exciting return of football to San Antonio with head coach Mike Martz and The Fleet taking on Mike Riley and his Commanders on CBS in primetime at The Alamodome. Head Ball Coach Steve Spurrier makes his much-anticipated return to the sidelines for The Orlando Apollos to take on top defensive-mind Kevin Coyle as he makes his head coaching debut for The Atlanta Legends at Spectrum Stadium. Sunday’s Alliance action features the highly-anticipated head coaching debut of Tim Lewis and Heisman trophy winner Trent Richardson’s return to Alabama, as The Iron take on head coach Hall of Famer Mike Singletary and The Memphis Express at Legion Field. Rick Neuheisel and his high-powered offense take on National Championship winning head coach Dennis Erickson to go head-to-head at the professional level when Arizona takes on Salt Lake at Sun Devil Stadium. Fans looking to secure tickets for the inaugural season can purchase tickets on AAF.com or by calling 1-833-AAF-2019. 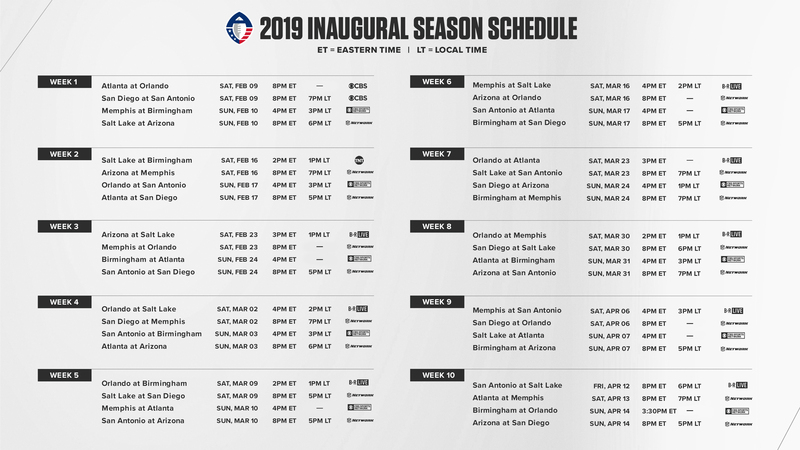 For a look at The Alliance’s full schedule, visit https://aaf.com/2019-season-schedule/. Led by some of the most respected football minds in the game, The Alliance of American Football is top-flight professional football fueled by an unprecedented Alliance between players, fans and the game. Founded by TV and film producer Charlie Ebersol and Hall of Famer Bill Polian, The Alliance features eight teams with 52-player rosters playing a 10-week regular season schedule beginning February 9, 2019 on CBS, followed by two playoff rounds and culminating with the Alliance Championship game at Sam Boyd Stadium in Las Vegas on April 27, 2019. Additional broadcast and distribution partners include Turner Sports — TNT and B/R Live — as well as the NFL Network. Fans can stream key Alliance matchups live via the free Alliance app while accessing integrated gaming options. With a focus on player well-being on and off the field, The Alliance provides players with a commitment to safety and state-of-the-art equipment as well as a comprehensive bonus system, post-football career planning, financial counseling and scholarship support for postsecondary education. For more information, visit https://aaf.com/.